Eye: A pronounced amber gold. Nose: Elegance of vanilla and fruit aromas. Palate: A fantastic rancio, with noble eaux-de-vie that are velvety and mellow. This Cognac oozes style and grace, from the understated, artisan packaging to the precious Premier Cru nectar within. 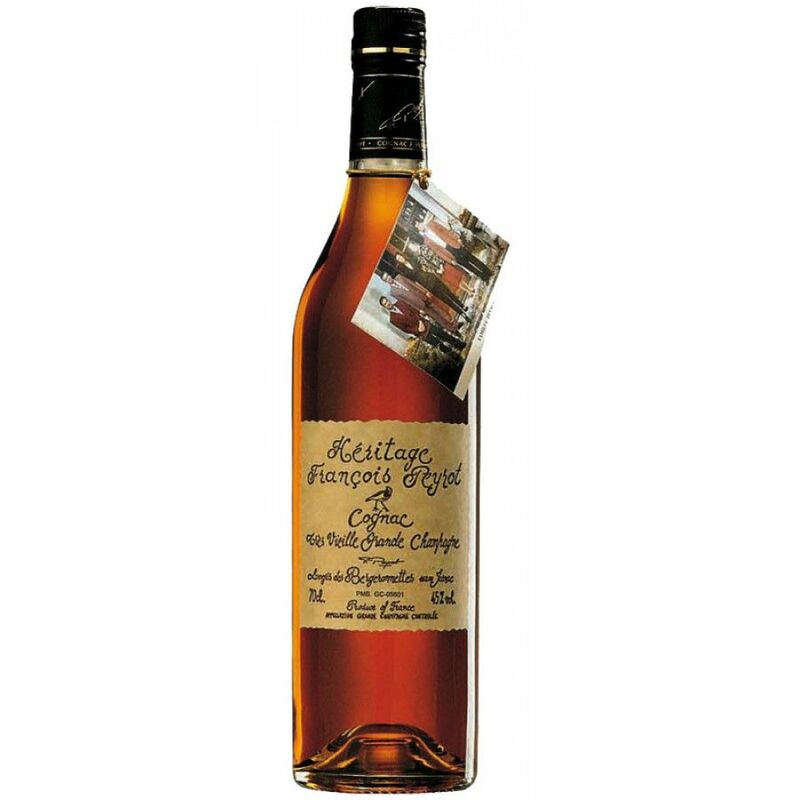 The Francois Peyrot Heritage is a very old Cognac with a deep reaching history. It possesses all of the desirable qualities of a well-aged Cognac; rancio, mellow tones and elegant body. It is a personal expression of this Cognac producer, and its Hors d’Age status indicates its ability to reflect a historic moment in each part of its carefully constructed blend, as they are typically aged between 30 and 50 years. It is bottled at 45% ABV. It is assembled with a series of eaux-de-vie from the Grande Champagne cru, also known as the Premier Cru. Its name denotes its fine reputation. Thanks to millions of years of fossilization and soil rich in limestone and chalk, it makes for wonderful eaux-de-vie such as that of the Peyrot Heritage Tres Vieille Cognac. The Grande Champagne cru is positioned optimally so as to absorb sunlight and provide excellent drainage for the grapes. The Bergeronnettes vineyard spans 25 hectares in the Grande Champagne terroir, and for the past 20 years the family have dedicated themselves to prioritizing quality over quantity, and respecting the environment. They have eliminated the use of pesticides and chemical fertilizer with controlled production costs and responsible management of the vineyard. All this so that they can ensure that they are passing down a sustainable estate to their grandchildren and the next generation. The only way to truly honor this Hors d’Age Cognac is by enjoying it neat. The decanter of the Francois Peyrot Heritage Grande Champagne is impressive in itself. The label is designed in a charming handwritten style that looks aged and worn, and the neck of the bottle bears a photo of the family. It is a truly personal expression of the Cognac house. Covering a vineyard of 25 hectares, the cognac estate “Logis des Bergeronnettes” in Jarnac, Charente, is entirely composed of Premier Cru Grande Champagne. This family run estate, Cognac Francois Peyrot S.A.R.L., has a history dating back over four generations and has grown in size from its modest seven hectare beginnings. Producing wine and cognac in traditional ways, the estate tends their vines in the most natural of ways. Today, they refuse any use of chemical fertilizers and pesticides to produce their cognac in harmony with the environment. Eye: Gold amber. Palate: Long and elegant. An explosion of subtle flavors such as light tobacco, coffee and cocoa and some light spices. Then, releases a rich and harmonious finale. An amazing flexibility to the palate. Nose: A floral symphony.